In hindsight, I realize this was a terrible idea. I guess I was just excited to be going racing, and I suppose my giddiness turned into an unreasonable optimism. Deep down, I knew we weren’t likely to beat Road & Track’s team at American Endurance Racing. But that didn’t stop me from betting R&T web editor and former Jalopnik editor Travis Okulski that, if we lost, I’d chug a bottle of windshield washer fluid. We lost. 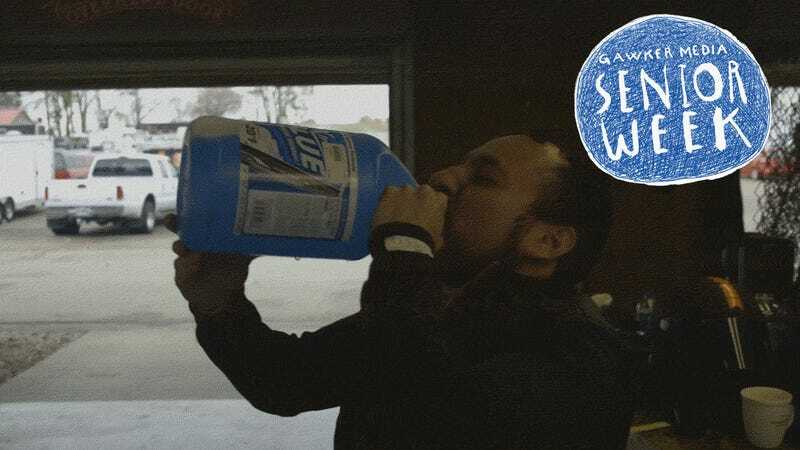 DISCLAIMER: UNDER NO CIRCUMSTANCES SHOULD YOU ACTUALLY DRINK WASHER FLUID. NO NO NO DON’T DO IT NO. 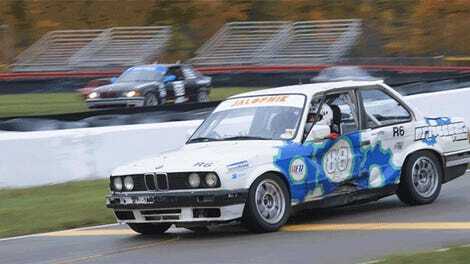 We lost, in a pretty dramatic way, a race at Mid-Ohio racetrack, where we were driving a fantastic BMW E30. We were pitted against the team from Road & Track for something they made up called the Enthusiasts’ Cup, really just an excuse so R&T and us could compete against one another in our own class. I still had some hope, though, mostly hope that Travis would do something stupid, which, I think we can all agree, is a reasonable thing to hope for. Then the rain came, and that should have washed away any residual hope I had. Mid-Ohio in the rain is like a skating rink. I had the first stint out, and all I really managed to do was spin out a bunch and then drive slow enough to get called back in, embarrassingly. Raph went out next, managed a bit more speed, but also managed to spin out and get T-boned, letting us lose to R&T nice and early. I was so busy spinning around on the track, I forgot to try and get out of my bet with Travis. Which is why I had to chug all that washer fluid. Winshield washer fluid seems like it’d be fresh and minty and delicious, right? It’s not. Oh god is it not. It’s terrible. It burns and burns and makes your brain act like a high-strung robot you just asked to divide by zero. It was never meant to be in a human body, which is why my (roughly) human body ejected it so quickly. Don’t try this. Don’t ever try this. None of you. Never, ever, ever do anything this stupid. Or make a bet this stupid. Unless you really think you can win? What kind of odds are we talking? Also: DON’T DRINK WASHER FLUID. UPDATE: In the interest of nobody doing this, we shot this as a goofy joke. I wasn’t really drinking washer fluid because that would, you know, kill me, and I still have so much more to say about indicator lights. So, again, please please please nobody drink washer fluid because you’ll end up dead and I’d rather have you as a reader/commenter than dead.